The Geneva Motor Show is upon us, which means we get another wacky design by Swiss designer Franco Sbarro’s students at France’s Espera Sbarro school. This year’s model is called the “4x4+2,” and it involves an old Porsche Cayenne, six wheels, and a crap-ton of bumpers. 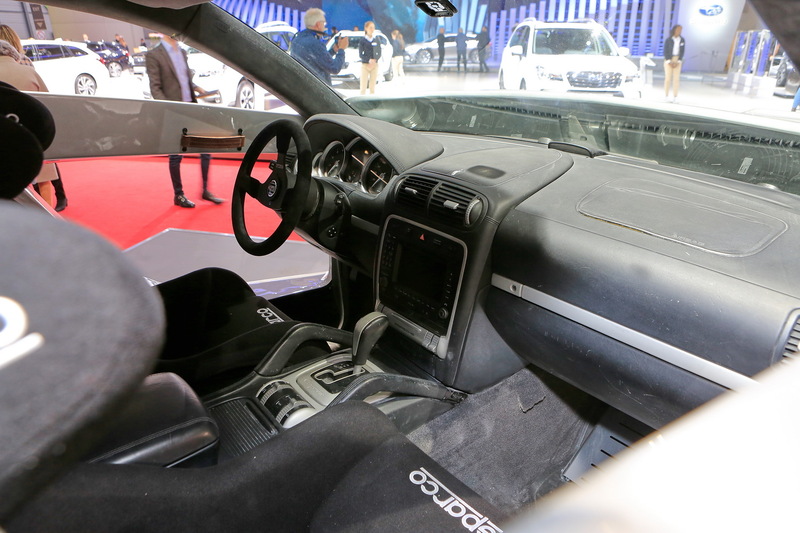 Yes, somehow underneath this madness is a Cayenne, at least based on interior photos floating around the internet, which show a dashboard that looks just like that of Porsche’s first mass-market SUV. Geneva Motor Show’s website says the Sbarro makes 550 horsepower from a V8 engine, and then sends the grunt through a six-speed auto to all four wheels. So it’s probably safe to say this is a first-gen Porsche Cayenne Turbo S underneath the crazy exterior (the car show’s website does say the engine’s displacement is 5.0-liters, not a 4.8, but perhaps that’s an error?). 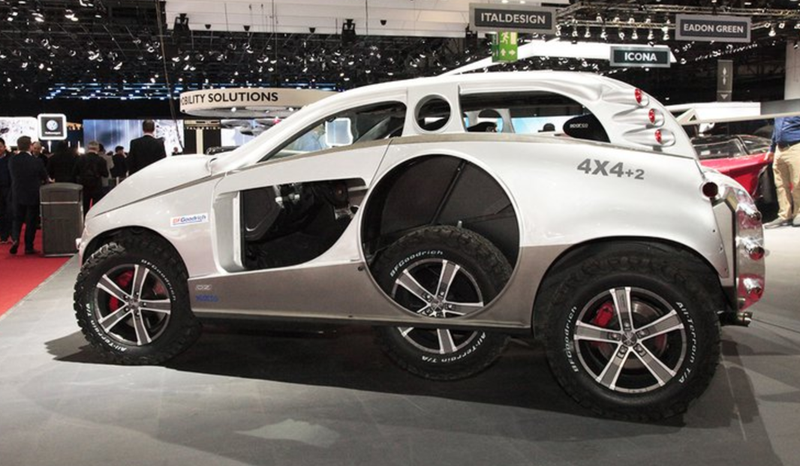 Information about the Sbarro “4x4+2" is scarce, perhaps because the design is meant to speak for itself. But does it? Considering the fact that I’m left with so many questions, I’m leaning towards “no.” Or maybe these concepts are meant to leave you confused? First, the obvious question: What’s the deal with the extra wheels on the side? It appears that they don’t drop all the way down, so they’re almost certainly not powered. Maybe they’re spares, but why would they need to drop down? Couldn’t you just access them through the big hole? I’m guessing they’re just there for looks, and also to improve the vehicle’s breakover angle? Also, what’s with all the 1990s-style tube bumpers? And where’s the glass? Looking at the front, I can’t help but wonder where the radiator is. I see huge cooling openings in the hood, but those appear to go to intercoolers. Also, what’s with that cylinder below the three tubular bumpers? Is that a rolling pin like those found on World War II-era VW Kommandeurwagens? Between the “rolling pin” out front and the extra wheels in the middle, it seems Sbarro designed this 4x4+2 specifically to climb steep grades and to crest sharp peaks. Though this drawing on the Geneva Motor Show’s website makes it seem like it might have been geared more towards Baja-style racing than rock crawling, in which case, the “spare tire” theory would make more sense than the “breakover angle improver” guess. Honestly, I’m not even sure what the heck is going on with this old Cayenne, but I like it. I think. Honestly, I’m not sure.